This section focuses on practices that involve outreach and enrollment across multiple health and non-health programs. Examples include coordinated efforts to help individuals receive services from multiple programs or efforts to target beneficiaries of one program for outreach efforts from another program. Likewise, multi-program coordination may involve screening consumers for potential eligibility, educating them about available benefits, or helping consumers complete and submit applications. Outreach can also focus at particular locations, such as tax preparation sites that serve numerous low-income clients who qualify for many need-based programs or hospital emergency rooms with many uninsured who qualify for health coverage. The coordination of outreach and enrollment across multiple programs can facilitate enrollment into one program by leveraging either: (a) the consumer contacts maintained by a different organization or agency; or (b) the consumer demand for a different service. By collaborating with outside organizations, a health or human services program may be able to reach eligible consumers while reducing outreach burdens on agency staff. 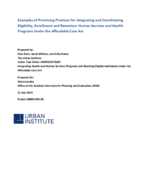 The practices highlighted in this category involve a Medicaid enrollment effort in Minnesota and multi-program enrollment conducted by Single Stop USA in community colleges across the country.